On September 21, 1980, Atlanta's enormous new passenger terminal, the largest in the world, opened for business. Dubbed "Midfield" because of its central location between the runways, the complex is still in operation today although it has been expanded through the years. 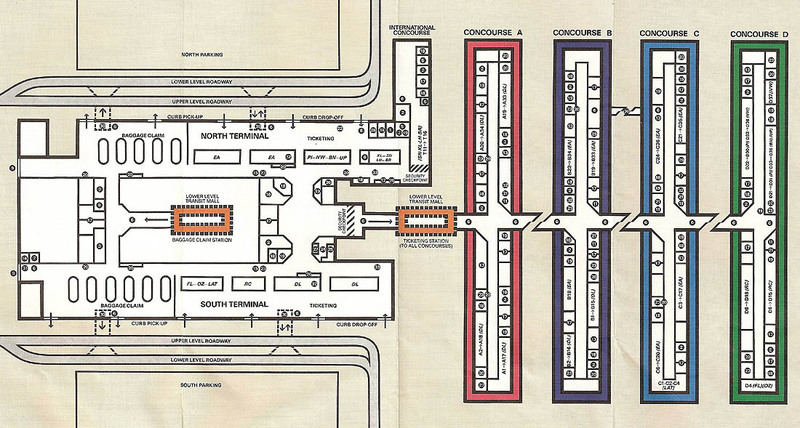 The terminal was built around a simple functional design: two symmetrical landside terminals connected to 4 remote parallel concourses via an underground "transportation mall" featuring moving sidewalks and a futuristic shuttle system. This modular design also allowed the airport to extend the underground mall to the east and add more concourses as traffic increased over the years. By 1980 standards, the facility was nothing short of revolutionary. 37 years later, it is still the largest passenger transfer hub in the world. The next few pages explore the early history of the midfield terminal. 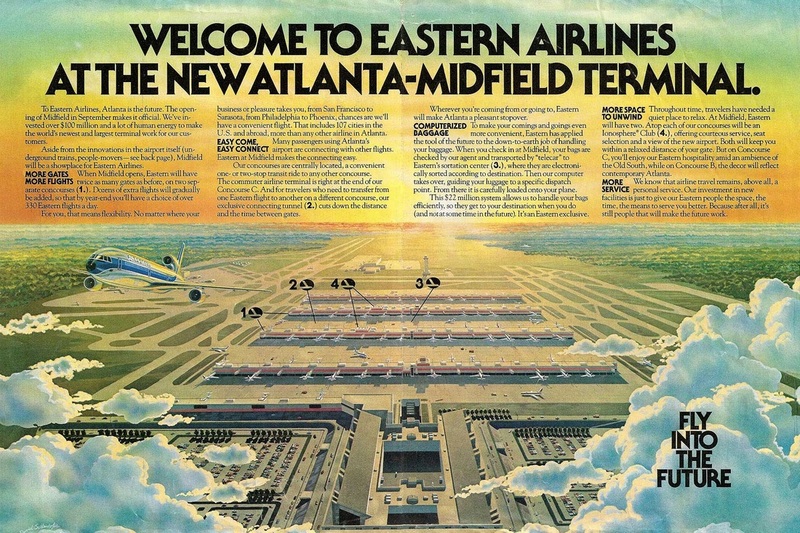 An Eastern Airlines advertisement highlighting the new midfield terminal. This was an insert from a special 40-page Atlanta Journal Constitution report on the new terminal which was printed on September 14, 1980, a week before opening day. For a larger version CLICK HERE. 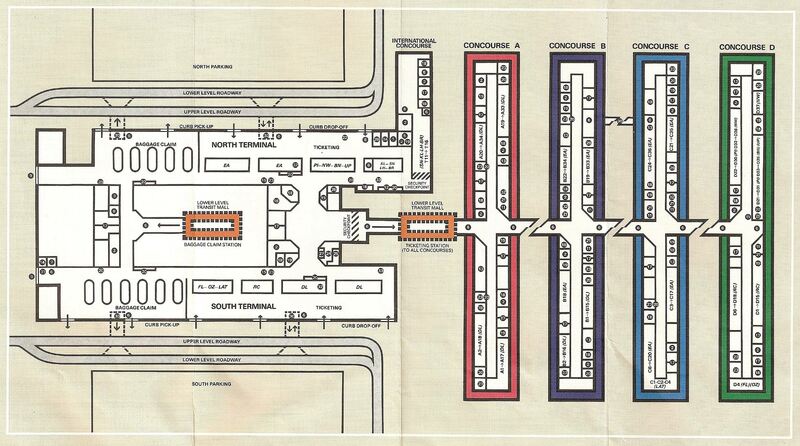 A circa 1981 map of the Atlanta airport terminal. The concourses are connected by an underground train system that once featured a robot voice that would state "This vehicle is leaving the station. Please hold on. The color coded maps and signs in this vehicle match the station colors. Please move to the center of the vehicle and away from the doors." The map below shows the colors the robot voice referred to. Larger version HERE. 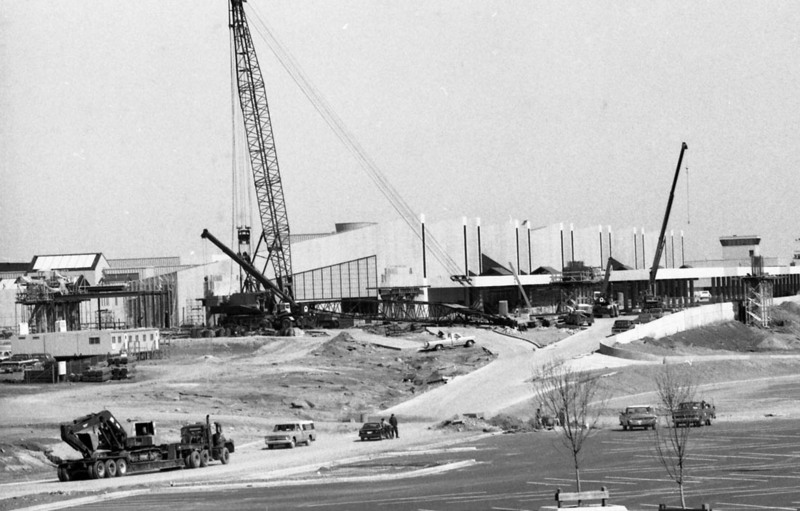 The south terminal is shown under construction on March 11, 1980, a little over six months before opening day. Courtesy Atlanta Journal-Constitution Photographic Archives, Special Collections and Archives, Georgia State University Library. 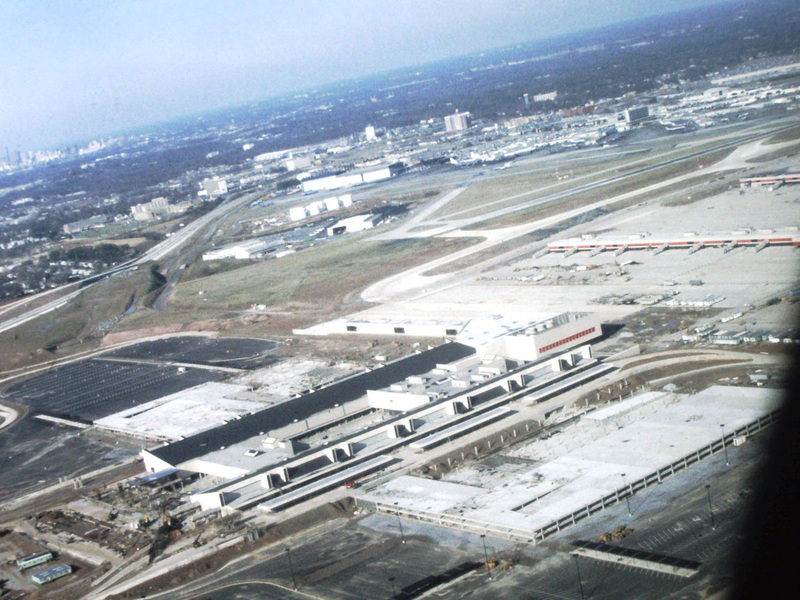 Charles Merk took this photo of the midfield terminal under construction in April 1980. 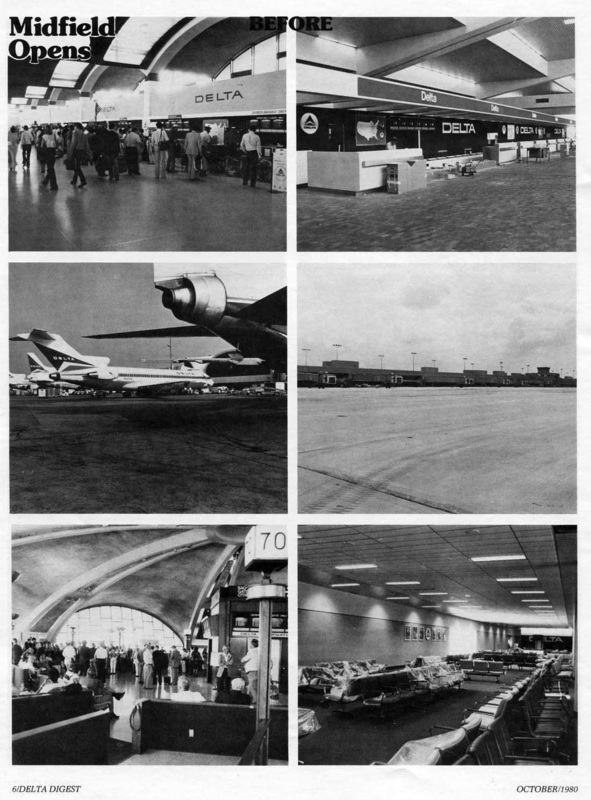 The 1961 terminal is at upper right. Click HERE for a larger version. An Atlanta Journal-Constitution article about the ambitious plans for a THREE HOUR move from the old to new facility. Here's an excerpt from the above article as well as an interesting comparison between the old and new terminals. 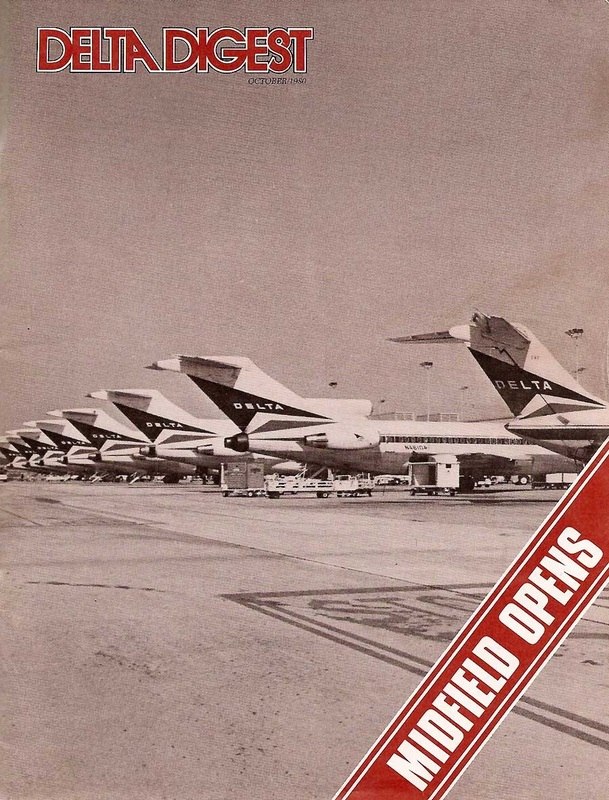 The cover of the October 1980 issue of Delta Digest, a magazine published for Delta Air Lines employees, features an impressive lineup of 727s and a DC-9 at the new terminal. 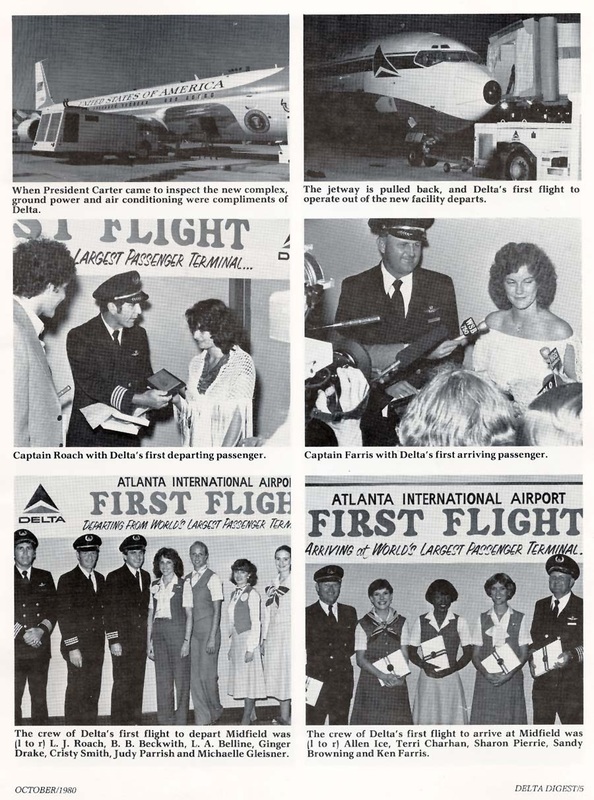 This page comes from the October 1980 issue of the Delta Digest and details some of the "firsts" of opening day, September 21, 1980. The October 1980 issue of Delta Digest also featured these before and after comparisons of the old "Jet Age" and new "Midfield" terminals. 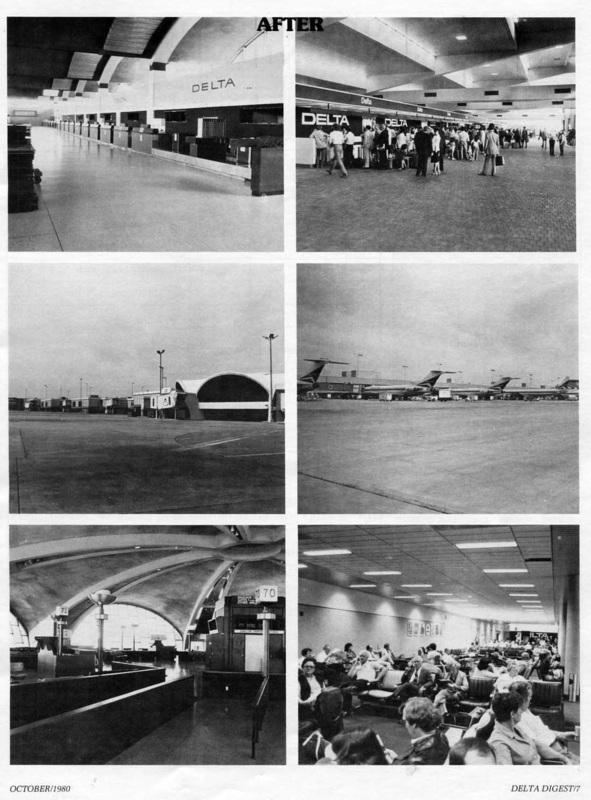 Ironically, they juxtaposed some of the best features of the old terminal (the spacious modern architecture and areas full of natural light) with some of the worst features of the new terminal (the claustrophobic windowless gates and the overall sterile, generic look). 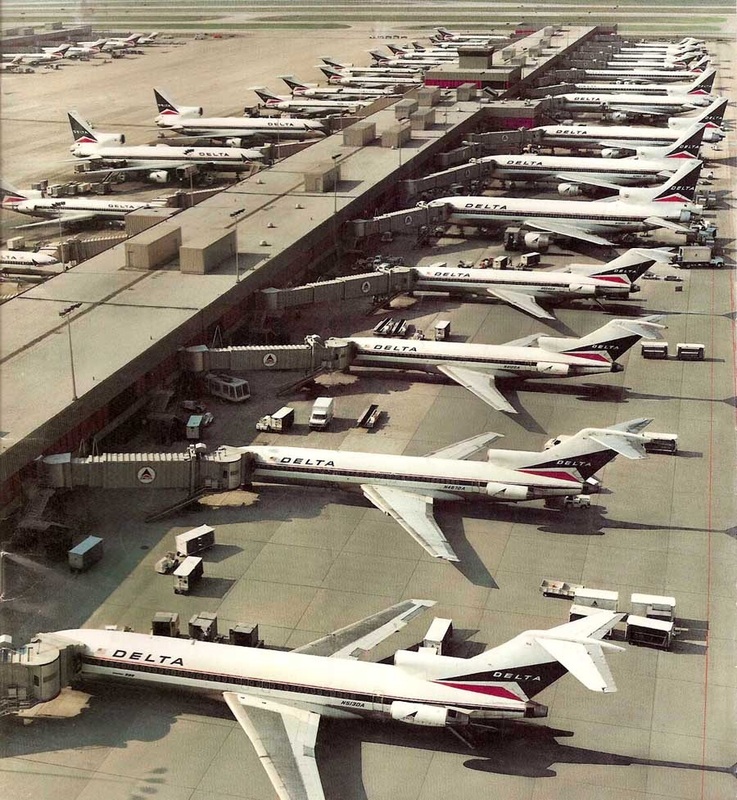 This stunning 1981 view of Delta's operation at the midfield terminal is a perfect illustration of why Atlanta has long been the largest connecting hub on the planet. Dozens of aircraft arrive and depart within minutes of each other, allowing passengers to connect to flights to and from virtually anywhere in the world. In the early 1980s Delta parked their aircraft in "zones" according to type. The large L-1011s and DC-8s were typically parked near the center of the concourses while the smaller 727s and DC-9s were parked near the ends. This reduced walking distances for the majority of passengers and created less congestion inside the concourses.